His tiny body was nearly bald and covered in painful scabs. Tired and hungry, the puppy was constantly scratching at his itchy skin. His mom or siblings were nowhere in sight. At just 4 months old, little Jamie had already been through so much. 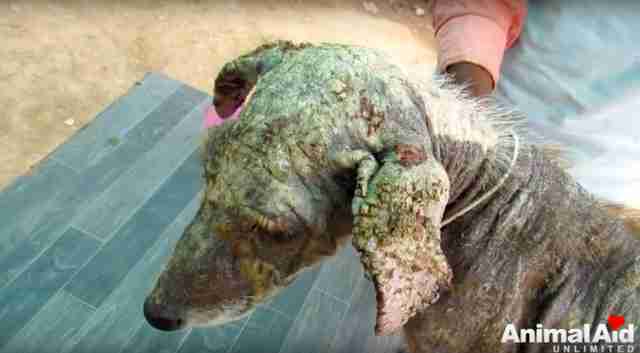 Born on the streets of India, Jamie got sick with mange and wandered around without help for weeks and weeks. Until one day when homeowners noticed Jamie passing by their house and called Animal Aid Unlimited for help. It was the moment he had been waiting so long for. As soon as Jamie saw rescuers, he wouldn’t stop wagging his tail. It was likely no one had given him affection for a while due to his horrible skin infection — but he was finally getting the love he yearned for. “Jamie was a lovebug from the beginning,” Erika Abrams, co-founder of Animal Aid Unlimited, told The Dodo. As rescuers outstretched their hands, he approached them wiggling his whole body and leaning onto their legs. 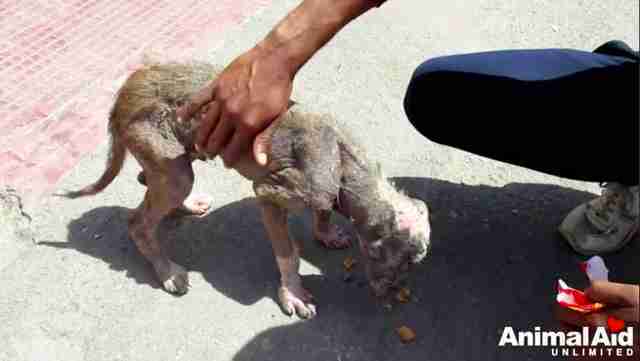 The puppy’s condition was among the worst the group had seen in a young street dog. His head especially was covered in thick scabs, making him look scaly. 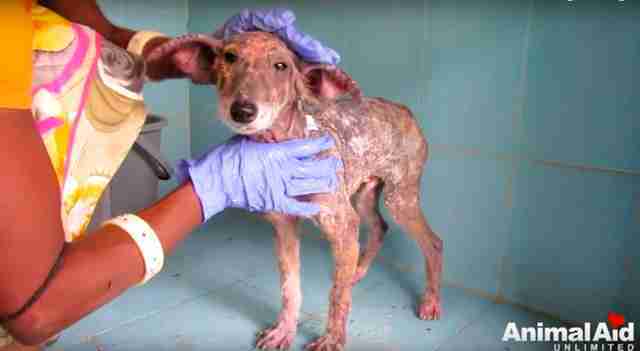 The rescue team started Jamie on medication for his skin infection and gave him frequent medicated baths to soothe his nearly raw skin. Surprisingly, Jamie seemed to love bath time. As the weeks went on, Jamie’s health kept improving. His hair started growing back, and after five weeks of intensive care, he had completely transformed into a furry, healthy dog. With his improved health, little Jamie became even more affectionate and loving toward his caretakers. Thankfully, the family who originally contacted the rescue about Jamie has already agreed to take care of Jamie from now on. Given his sweet and friendly personality, Abrams is certain the little pup won’t have any issues making new friends out and about at his new home. “His charm and outgoing, perky nature will help him build sweet relationships with many of his human neighbors,” Abrams said. To help more dogs like Jamie, you can make a donation to Animal Aid Unlimited.